Garden Design: Back yard living idea. A terrific backyard space to relax and entertain at a NY residence. Directly off the house is a small terrace and pergola with two chaise lounges with views to the Hudson River. A lower patio for dining is framed with a stone sitting wall which helps two form an outdoor room, yet keeps the views open to the yard. Lighting is recessed under the stone coping as well as fixtures placed high in the trees. A small outdoor kitchen is situated several steps down from the main patio. The main attraction is a Koi pond and several waterfalls with a stepping stone path that takes you across the pond to the back yard. The rest of the property is lushly planted with Ferns, Perennials and Shrubbery. 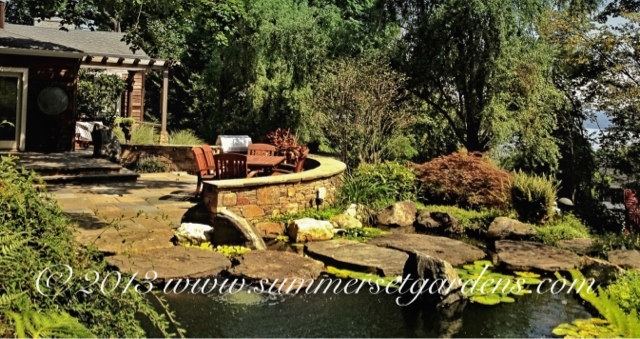 Landscape, masonry and pond design and construction services in the NJ and NY areas.